Apr-10-04 Benjamin Lau: Some score errors after the 74th move. chessgames.com: What do you mean? Apr-26-05 Pawn Ambush: I say again what's the rush to play 4...c5 against 4.Qc2. 4...Nc6, 4...d6, 4....Qe7,4...O-O 4...d5 even 4...a5. Promise more. Apr-26-05 arifattar: Just wondering if there was any way Khan could have saved this one from move 40 onwards. 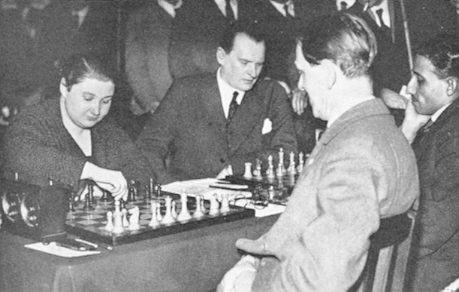 Wouldn't a modern GM have resigned much earlier? Apr-26-05 Pawn Ambush: To me it seems lost for black his pawns are fractured his kingside busted, no counter play and his bishop is bad and white has a real good kingside pawn structure to hide his king. Nov-06-06 Resignation Trap: According to Alekhine, the only possibility for Black of prolonging the game after move 40 was with 43...Qa3 (instead of 43...Qd2?) "...but, of course, with very little hope". "Losing a second pawn, after which he could quietly resign." Perhaps irritatingly from <Alekhine's> point of view, <Sultan Khan> did not quietly resign here. Instead, he quietly played on for another THIRTY SIX moves. <Khan> biographer R.N. Coles said that the Sultan suffered the loss of many games that would likely have been drawn if he had dissuaded himself from the opinion that it was virtually part of the rules of chess to play every time for a win. This stubborness also manifested in examples such as this game, where <Khan> played on in lost or losing positions long after most would have thrown in the towel. Jan-15-12 Shams: <jfq> Was Alekhine made to suffer adjournment here? Any idea what the time control would have been? jessicafischerqueen: <Shams> I'm afraid I don't have the tournament book, so I don't know the time control or whether there was an adjournment or not. <Alekhine> doesn't mention either in his notes for the game. Feb-02-17 Ylva Wiklund: <jessicafischerqueen> Could you tell me how you would have responded to 16. e4 ? London 1932- Resign? Why not 30 more moves?